I can not turn of the knobs to ignite my gas cooktop burner. So the back right burner is now useless. How can we fix it? This is a problem with the gas valve for the affected burner. The knob is attached directly to the bad valve. If you can use a screwdriver and a wrench and can fog a mirror, you can do this repair! This diagram shows you how to do the repair, click it for larger view in a new window. Be sure to leak check the gas tube connection on the new valve after you get it installed. This video explains the basic idea. 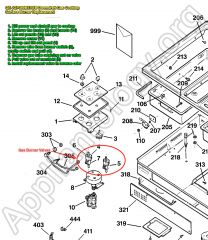 This entry was posted in Stove Repair on March 21, 2013 by Samurai Appliance Repair Man. An electric range has two main working parts: the stove or cooktop elements and the oven elements. The most common problem with stove elements is the receptacles get sloppy and stop making good, tight electrical contact with the element resulting in poor heating. The most common (and simplest) problem with the oven is that the bake or broil element self-destructs, sometimes in spectacular fashion. In this issue of Appliantology, ol’ Samurai’s gonna show you how to whup up on both of these common and easily-repairable problems. I’m always uploading new videos to my YouTube channel from my various appliance service calls as The Appliance Guru. You can keep up with ’em by subscribing to Samurai’s YouTube Channel. 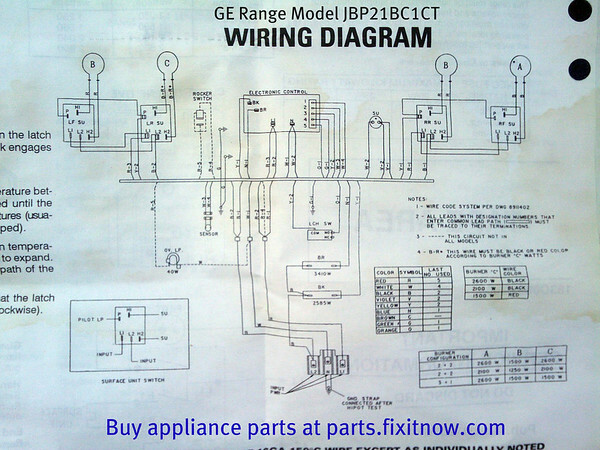 You can find whatever appliance part you need through the parts search box at Fixitnow.com or Appliantology.org. No harm in buying and trying with our 365-day, no-hassle return policy, even on electrical parts that were installed! Subscribe to the Appliantology Newsletter. This entry was posted in Oven Repair, Range Repair, Stove Repair on July 8, 2012 by Samurai Appliance Repair Man. This client called in with the complaint that the stove burners on her Thermador cooktop kept clicking after the burner was lit. Watch in horror and amazement as The Appliance Guru uncovers the gruesome cause for this problem. WARNING: This video contains scenes that some viewers may find disturbing. Viewer discretion advised. You can find whatever appliance part you need through the parts search box at Fixitnow.com. No harm in buying and trying with our 365-day, no-hassle return policy, even on electrical parts that were installed! Subscribe to our FREE, award-winning newsletter, Appliantology: The Oracle of Appliance Enlightenment ==> http://newsletter.fixitnow.com and download your free report on appliance brand recommendations! Every issue is jam-packed with appliance repair tips and inside information direct from the Samurai’s fingertips to your engorged and tingling eyeballs. This entry was posted in Range Repair, Repair Video, Stove Repair on June 21, 2012 by Samurai Appliance Repair Man. Certain numbers on my oven have not been working, then last week the bake button also stopped working. I replaced the control panel and now none of the keys are working. Could I have done something wrong in the installation or do I also need the computer behind the control panel? Do you have some installation instructions so that I can see if I missed any steps. First off, recheck all your connections to make sure they’re in the right place. Also, make sure the ribbon connector for the touchpanel you replaced is firmly seated all the way down in the receptacle on the control board computer. Disconnect it and reconnect it. If all that checks out good, then probably what’s going on is that static electricity on your body took out the control board (the computer behind the touchpanel) when you were installing the new touchpanel. Based on your original problem description, replacing the touchpanel was the right thing to do but it may not have been done correctly. The assembly and access to the touchpanel and control board are usually pretty straightforward– if you can replace the touchpanel, you can replace the control board. The most important installation instructions for installing the new touchpanel and/or control board is to ground out static electricity on your body! These control boards contain very sensitive electronic components that are easily damaged by static electricity. Most people don’t realize just how susceptible to damage from static electricity they really are. This is why the installation instructions that come with the control boards will always have big notices about static electricity grounding from your body. In this regard, the most important step you can take is to wear a ground strap from your body to a grounded surface to ground out any static electricity you may be carrying. You can purchase the ground strap from your local radio shack store, they’re not expensive at all. You can find whatever appliance part you need through the parts search box at here at Fixitnow.com. No harm in buying and trying with our 365-day, no-hassle return policy, even on electrical parts that were installed! This entry was posted in Oven Repair, Range Repair, Stove Repair on April 12, 2012 by Samurai Appliance Repair Man. All gas ranges come from the manufacturer set up to burn Natural Gas (NG). If you’re set up to burn Liquid Propane (LP) in your house, you’ll need to convert the range for this. Most gas ranges come with instructions for doing this but sometimes they get lost or “borrowed” by a sticky-fingered tech who worked on your range. These instructions below are for a Frigidaire gas range, FPDF4085KF, but the same idea applies to all gas ranges. If you have some other model, you can use this as a guide for the general concept of converting your gas range to burn a different fuel. This entry was posted in Oven Repair, Range Repair, Stove Repair on April 7, 2012 by Samurai Appliance Repair Man. Our sealed burner GE stove model no. JGBP30WEH2WW now about seven years old still is clicking, however, the burners only llght occasionally. The simmer burner on lights rarely. The burners were cleaned as per instructions from the GE manual. Using matches the burners light immediately. What are your suggestions? New spark ignitor switches, do I do the repair, and where can I order them from. This entry was posted in Oven Repair, Stove Repair on June 13, 2011 by Samurai Appliance Repair Man. 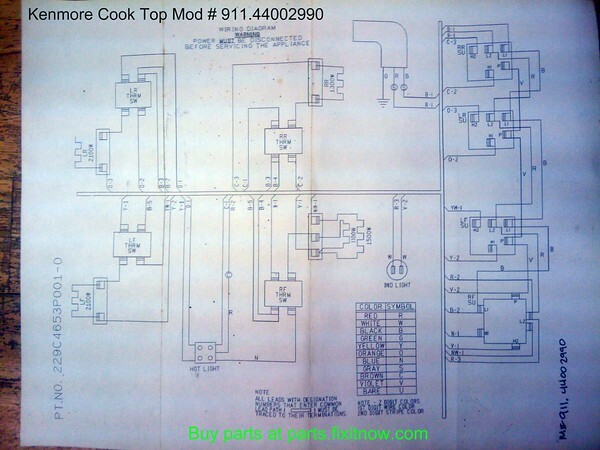 This entry was posted in Oven Repair, Range Repair, Stove Repair, Wiring Diagrams and Schematics on November 3, 2010 by Samurai Appliance Repair Man. 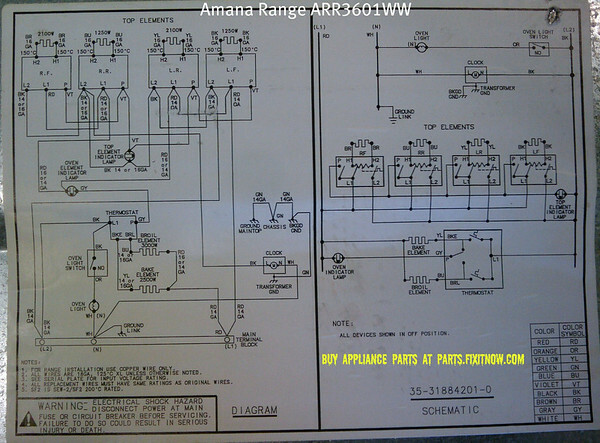 This entry was posted in Stove Repair, Wiring Diagrams and Schematics on October 19, 2010 by Samurai Appliance Repair Man. 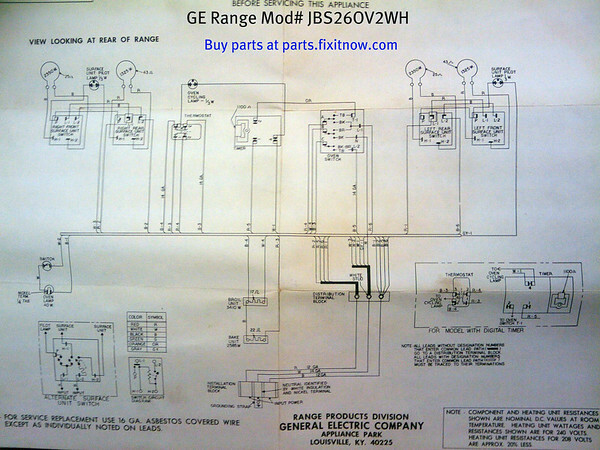 This entry was posted in Oven Repair, Range Repair, Stove Repair, Wiring Diagrams and Schematics on September 27, 2010 by Samurai Appliance Repair Man. 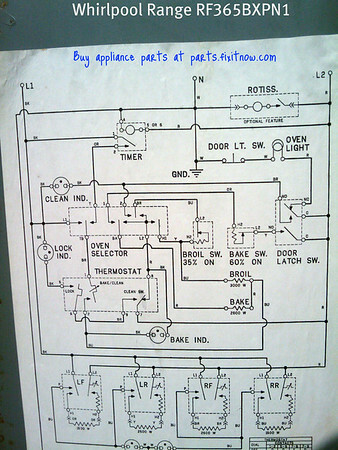 This entry was posted in Stove Repair, Wiring Diagrams and Schematics on September 22, 2010 by Samurai Appliance Repair Man. This entry was posted in Stove Repair, Tweets on September 16, 2010 by Samurai Appliance Repair Man. This entry was posted in Stove Repair, Tweets on September 13, 2010 by Samurai Appliance Repair Man. This entry was posted in Oven Repair, Range Repair, Stove Repair on September 10, 2010 by Samurai Appliance Repair Man.